Yi Ch'ang-ho (Lee Changho, RR: I Chang-ho, M-R: Yi Ch'ang-ho, 李昌鎬, born 29 July 1975) is a Korean, professional 9-dan. He is considered to have been the strongest player in the world from around 1995 through 2006. Lee was born on 29 July 1975. He learned go from his grandfather at the age of six, and became apprenticed to Cheon Yeong-seon 6-dan at eight. In 1984, he won a national youth championship, placed 3rd in the World Youth Goe Championship, and became a live-in disciple of Cho Hun-hyeon. He became an insei the following year and a 1-dan professional the year after in 1986. In the late 1980s, he started winning the Korean titles that his teacher, Cho, had long been dominating. In 1992, he won his first international title (the 3rd Tong Yang Securities Cup). As of 2009, his record in major international titles stands at #1. With his win of the Chunlan Cup tournament against Hane Naoki in 2003 Lee Changho has won every single international Go tournament at least once (not counting obsolete tournaments that he couldn't have participated in). 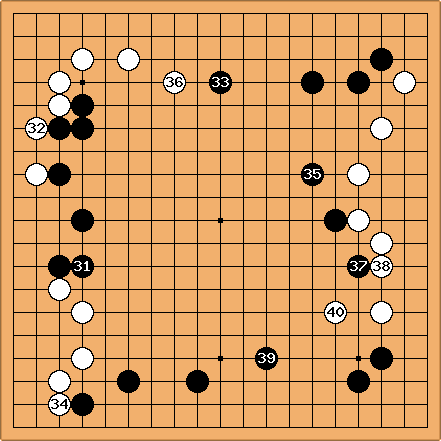 The Korean press calls this a "Grand Slam" in go. On 28 October 2010, Lee married amateur go player Lee Do-yoon?. Lee employed a fantastic ability to dictate a leisurely pace right from the opening, whether playing as Black or White. He often played probes which would limit the opponent's strategic options, and found sequences that would guarantee making miai of all the large points. He often found ways to concede to an opponent's intention and avoid nasty conflicts without falling behind. This strategy was made possible due to his fantastic endgame calculation. If anything, one of Lee's most well-known traits is his brilliant and subtle endgame play, with the Koreans' terming Lee's endgame skill as 'divine calculation'. In Lee's earlier games, important groups rarely died -- neither his nor his opponent's. For many years, players didn't fully understand how strong Lee was. He did not pull clear ace-in-the-hole moves that left audiences stunned or overwhelm opponents with powerful fighting/attacking. Instead, his 'brilliant' moves could often said to be subtle, hiding their intent beneath the surface. Lee's first teacher, Cheon Yeong-seon, said that Lee always tried to come up with myoshu. Then Lee became a pupil of Cho Hun-hyeon. At first, Cho doubted the talent of the kid, since he could not even perfectly reproduce the game he played that day. The conventional wisdom dictates that a go genius is endowed with magnificent intuition, quick razor sharp analytical ability, and vast memory. In Cho's assessment, the kid fell short of expectation in most categories of natural talent. But, Cho noticed that Lee was amazingly studious and was a deep thinker endowed with a different mindset. He later decided that Lee was of a "different type" of go genius. During his studies under Cho, Lee's style got completely overhauled. He became a master of "common" moves instead of myoshu. Lee has come to prefer a safer move (from which he can plan future moves by being able to predict the opponent's reactions with high probability) to a myoshu that leaves unpredictability down the road. In so doing, Lee minimizes the factor of chance arising from difficult situations. In short, he has become a "control freak." So why was he to be transformed from a lover of myoshu to a seeker of seemingly average yet certain, effective moves? The reason is not precisely known. Yet, it is ventured that the motivation could have been the natural talent of his teacher, Cho Hun-hyeon, who is often dubbed as the most talented player. In the early stage of his career, Lee was criticized that his playing style was molded only to beat the teacher, Cho (as he was not as dominant over other top players). Although he later proved that his style was effective against anyone, the criticism has some truth as he confessed later indirectly that his goal was to beat the teacher. It was a question of how. Lee simply could not match Cho in natural brilliance. That is, it was impossible for Lee to follow in the footsteps of Cho and surpass him. Instead, Lee chose a path along which his magnificent calculation and deep thinking triumphs over Cho's natural brilliance and quick thinking. Simplification is the word that best fits Lee's style. In his game, everything is simplified. However, the level of simplification is quite relative. Hence, many were, and still are, unimpressed by his game (until they get to play him, as Chang Hao said). Quoting loosely his teacher, Cho Hun-hyeon, Lee sits and waits patiently in the depths of the unknown. You wait and wait to find out what Lee hides in the depths. You finally run out of patience and jump into the deep. Without fail, you find yourself trapped in the depths. In other words, it is the depth of simplicity. Around 2001, Lee began to be challenged by a new generation of players. His simple approach and peaceful methods became less successful as fighting players, such as Lee Sedol and Ch'oe Ch'eol-han, found ways to first force Lee into attacking positions and then turn them into all out fights where the other player could outmaneuver Changho. The first part of this method was most famously demonstrated in the 2001 LG Cup final against fellow counterman Lee Sedol. In games one, two, and five Sedol played stones and left unsettled groups that enticed Changho into directions where attacking was the clearest and simplest way to gain an advantage. Once Changho began attacking, Sedol would try to outmaneuver Changho in disadvantageous or slack results by threatening whole board fighting, which Changho would want to avoid. These fights also seemed to occasionally unsettle Changho, causing him to make surprising mistakes, lapses in judgement, or play at an uncharacteristic pace. Subsequent interviews have also stated that Lee had felt considerable pressure to perform against the new, younger players. According to Kim Seungjoon 7d, part of the reason Lee Changho began to lose his composure was that he was no longer guaranteed to win by sticking to his old style. While some younger Korean players he inspired became as good in calculation, reading positions, and the endgame as he was, Lee was being forced to abandon or rely less upon his old style of often conceding a few battles and still winning the war. Lee pursues a new style that is more battle ready, much stingier, and more tightly gripped upon opponents. Cho Hun-hyeon takes an insightful look into what is happening with his pupil and Lee Sedol: "Is the era of Lee Changho over? No. It is just that the time has finally come that Lee Changho has a legitimate rival. The two will battle head to head for many years to come. After the smoke clears, we will see whose time this is." Being a veteran of the two greatest rivalries of the Korean Go history -- Cho beating Seo BongSoo by 2-1 ratio over a decade and then losing to Lee Changho by the similar ratio over the next decade -- Cho senses another rivalry brewing, something Yoo ChangHyuk could not give to Lee Changho. Lee Changho will change as Cho had to change in order to stay toe to toe with the pupil of his who shot him down from the very top of the world. Whether or not Lee is truly one of the greatest of all time will depend on what his metamorphosis may become and how effective it might turn out to be. Park Chimoon, a Korean Go critic, said that Lee Changho might be the greatest go strategist of all time as Lee has successfully come back against the so called Lee Changho killers (e.g., Yoda Norimoto et al.). We will see the real truth of it in as the smoke of rivalries clear. Chang Hao 9p: You get to know how strong Lee is only when you play him. Rui Naiwei: Lee lets you do what you want yet wins over you at the end. 1989 2 8th KBS Cup; 5th New King Tournament? 1996 12 8th Asian TV Cup; 1st Ch'eonweon; 35th Ch'oegowi; 14th Daewang; 9th Fujitsu Cup; 7th Kiseong; 19th Kukgi; 40th Kuksu; 27th Myeongin; 7th Tong Yang Securities Cup; 30th Wangwi; 1st World Go's Strongest Player Tournament? Regarding Rui Naiwei's favorable record against Lee Changho -- 6 to 2 in favor of Rui as of February 2005 -- the prevailing theory goes as follows. It takes a terrific aggressive player to defeat Lee Changho. Cho Hun-hyeon even had to change his style in favor of more aggressive all out warfare against his pupil. 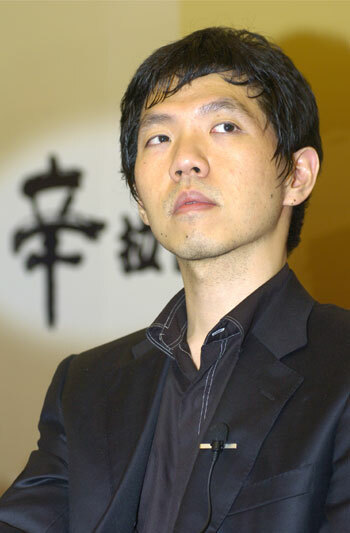 Lee's series of defeats by younger players such as Lee Sedol and Choi CheolHan support the view. Rui's playing style is undoubtedly one of the most aggressive. Her ultra-aggressive and creative offense may offer greater challenges for Lee as he cannot predict Rui's next moves and thus fails to take control of the game like he usually can do against other players. One quasi-theory goes like this: Rui greatly admires Lee as both a player and as a person. Inspired, she plays her best game against Lee. One can imagine how the two above factors combine to a plausible--though not necessarily correct--explanation that Rui plays an unusually inspired game against Lee, and her style is very difficult for Lee to handle. Another possibility is that, having played only eight games so far--without any series or multi-game matches--it is hard to say that Rui even necessarily has an edge over Lee. The law of averages may eventually catch up. Always modest, Rui says that Lee is beyond her and that she does not understand how she could defeat Lee, a far superior player, so many times. Nevertheless, it would be interesting to hear if those are her true thoughts on the matter. Yoda Norimoto was noted as giving Lee a hard time in international tournaments for many years, leading Yoda to be considered one of the Japanese aces in many international team tournaments. As of 7 June 2008, Yoda's record against Lee is 10-0-9. It is widely believed that Lee has a superior endgame technique and that he starts to play endgame moves sooner in the middle game than his opponents. But a short inspection of his games shows some other interesting aspects. It seems that he likes to play tenuki even more than the other guy. Of course, this is based on very good reading of the position, but the impression is that he plays contrary to the proverb. He plays big moves rather than urgent moves. Well, it turns out that he had read it out and found that the "urgent" move was not so urgent. It seems also that he is fond of the approach ko. Quite often rather large groups are at stake because he preferred a big move to a safe move earlier. Source: Go World Iss. 65 p. 39. Source: GoGoD, Lee Changho - milestones on the way to 100 titles. One of the funny stories about Lee Changho is that he did not know how to tie his own shoelaces even into his young adult years. While Lee studied under Cho Hun-hyeon as an in-house pupil, Mrs. Cho bought him shoes without laces because he would drag his feet around until someone finally tied them for him. I have heard many similar stories about how Lee Changho was totally preoccupied with Go and could not or did not pay attention to the everyday aspects of life. Regarding Lee's infamous inability to reproduce his own games, his brother recently posted a short message in Lee's homesite that even after he made professional rank, Lee Changho sometimes had difficulties reproducing his own games "in front of Cho Hun-hyeon." I suspect that it may be largely psychological considering the shy nature of Lee's and the special relationship between teacher and pupil (Pressure? Oh, yeah...). 15 June 2010, 16.00 (Korean time): During a 40 minute long press conference in Korea, Lee Changho has announced his engagement to miss Yi Doyun . Miss Yi Doyun is a strong baduk player herself and a Myongji University graduate. She is 11 years younger than Lee Changho, but Lee Changho replies: "In some ways I am rather young". They are already planning for a big(!?) family with 1-3 children. On 13 July 2012, Lee obtained his 1,600th career win. The win was against Park Jinsol?, in the preliminaries of the 14th Nongshim Cup. From 27 Feb. 1990 - 31 Aug. 1990, Lee Changho obtained 41 wins in 41 games. Complete list of these games. Some excerpts from an interview: http://gobase.org/games/inter/titles/samsung/4/.